I fear this one might get panned. Even with a talented cast and impressive special effects, this latest offering on the Pan myth should still walk the plank. 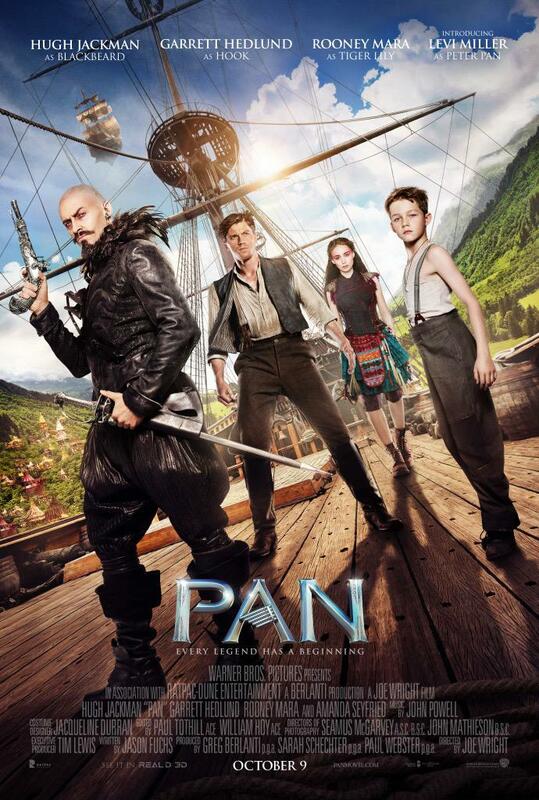 12-year-old orphan Peter (Levi Miller) is spirited away to the magical world of Neverland, where he finds both fun and dangers, and ultimately discovers his destiny to become the hero who will be forever known as Peter Pan. The opening zipped along. It was easygoing and got straight to business. We watch Peter endure life at the Dickensian orphanage. Battling the ever cantankerous Mother Barnabas. Played to perfection by Kathy Burke. Not enough of her if I’m honest. Levi Miller delivered an impressive debut for a young lad. There was the odd moment where certain lines and a couple of the scenes hindered with his delivery BUT nothing that can’t be fixed with a few more movies. And it wasn’t long before our young hero was plucked out of his bed and taken to Neverland. This part of the story I’d seen before in Once Upon A Time and it did feel like a retread for me. I was disappointed that the war time setting wasn’t used to its full potential. It did allow for a fantastic chase sequence with The Ranger pirate ship being pursued by the Royal Air Force. It was all a little too OTT for my liking BUT the pace and effects kept me subdued. For now. It was great to see Nonso Anozie finally getting more screen time. It was just a shame that after a memorable introduction as Bishop that he was pushed into the background. For the first half hour, I was pleasantly surprised. BUT the problems really popped up when Peter arrived in Neverland. The strange musical number in the mines didn’t set the right tone for me. A bunch of miners bellowing Nirvana’s Smells Like Teen Spirit and The Ramone’s Blitzkrieg Bop felt like something that should have been in Moulin Rouge. Things improved slightly with the introduction of Jackman’s Blackbeard. But that soon spiralled downhill. He lapped it up and was incredibly camp. A perfect panto villain. BUT that was also the problem. He came off far too comical. His bi-polar mood swings and OTT delivery soon killed what little tension there was around the iconic villain. I understand that it’s a family movie BUT I was more afraid of the CGI’d Sid from Toy Story than this chap. Speaking of iconic villains, Garrett Hedlund as James Hook was terrible. Don’t get me wrong, Hedlund delivered one of his most liveliest performances. He looked the part with that shark toothed smile. BUT he got on my nerves. He just shouted his lines (which were weak) and every time he appeared on the screen, I instantly wished him gone. Adeel Akhtar (Four Lions) was perfectly cast as Smee. He fell short of ol’ Bob Hoskins from Hook BUT he gave it a go and delivered the odd chuckle. Rooney Mara did her best with the role of Tiger Lily, the native chief’s daughter. The only problem with Mara’s character was that it was spoiled by an incredibly hammy love subplot with Hook. It was cringe-inducing. Hedlund even shouted during those bits and all! I know I said the animation was fantastic. And for the majority of the film, it was. Not quite sure whether it was worth the 3D investment. BUT there were a couple of things that didn’t look right. The Neverbirds looked terribly cartoony. They looked like something that should have been on the cover of a cereal box. The lovely Cara Delevigne popped up in a badly CGI’d cameo as a mermaid. I don’t know why they just didn’t have her swimming about in a mermaid costume instead (What?). Amanda Seyfried had the easiest job going as Peter’s mother. Anyone could have played her. The final twenty minutes were entertaining enough as Tiger Lily takes on Blackbeard BUT it was so rushed that it ended quite abruptly. It was a fresh take to see Hook and Pan start out as friends BUT we didn’t see any real conflict and by the end of the film, there wasn’t any indication of their rivalry brewing. Just a nauseating exchange that they will be friends forever. Awww . . . Yuck. Things were inevitably left open for another. BUT if I’m honest, it’s going to take a lot of convincing to get me to check out that one. It’s was too corny, frantic and didn’t even explore the mystery of Neverland. It was watchable BUT memorable? If anything this made me want to dig out my VHS (What are those?! Showing my age now) of Hook. Enough to keep the little ‘uns at bay for a couple of hours BUT it falls short of any of the other versions. This didn’t break my top movies list BUT there is still an engaging account of one’s man incredible story. So what’s it all about? After a near-fatal plane crash in WW2, Olympian Louis Zamperini (Jack O’Connell) spends a harrowing 47 days in a raft with two fellow crewmen before he’s caught by the Japanese navy and sent to a prisoner-of-war camp. Angelina Jolie takes the directing seat again and delivers a riveting (if overlong) re-telling of fear, hardship and endurance. O’Connell has certainly cracked the big leagues and with a performance like this, he will continue to do so. It’s great to see the transition he has made since his role as Cook in Skins. His accent seemed a little muddled in the opening sequence but that soon subsided as the film continued. The main thing I had to get over with was his badly dyed hair. The opening air battle sequence certainly got things going. It was fast, frantic and . . . really loud. A good action set piece. 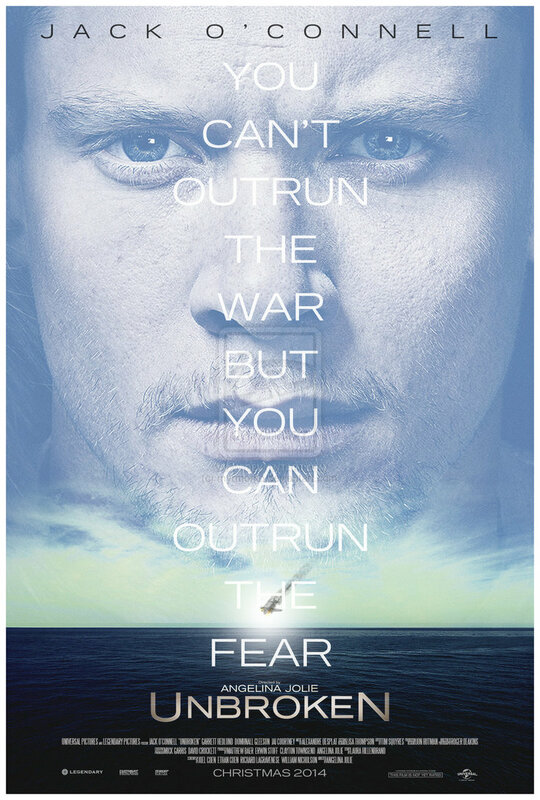 In between the air battles, the film flicks back and forth showing Zamperini’s childhood. A little hoodlum that refused to back down but was heading down the wrong path. That was until his brother drew Louis’ attention to the track team. Their relationship was captured perfectly. Both sets of actors who played young and (older) Louis and Pete were very good. To be honest, I wanted more of that. It seemed to flash through Zamperini’s childhood and Olympic campaign a little too quickly. I mean arguably it was just right. It wasn’t too corny and certainly didn’t linger too much. The Olympic race may have been predictable for those who know about Zamperini. Unfortunately I didn’t know a thing. A mistake now amended. BUT you were still rooting for him. A typical underdog story. A promising talent . . . that is until the war. The flashbacks subside when Zamperini is left stranded on a lifeboat with two of his comrades; Domhnall Green (About Time) and Finn Wittrock (Noah). Green had an impeccable accent and played the role very well. Another up and coming star to keep an eye on. The ocean raft scenes were tense. The shark fins swarming around their prey. If not the sharks, it was the hunger, the blistering heat or the very fear that the plane you’re trying to flag down is the enemy. The threat of death ever constant. The trio were fantastic and the first hour or so, I was engrossed in their struggle. Watching them as they tried to hunt and eat whatever they could to survive. There was one moment that rivalled Jaws in the scare factor. Unexpected for the cinema spectator next to me (Mum) who nearly elbowed me in the face. Certainly got the pulse racing. I couldn’t imagine being in a situation like that. BUT for 47 days! Unbelievable. And if that wasn’t enough, the soldiers are then captured by the enemy and sent to a Japanese POW camp under the horrific treatment of Wantanabe or The Bird. The Bird because he sees all. Takamara Ishihara was outstanding as Wantanabe. A sterling debut performance. I expect to see more from him. Hopefully not typecast as the bad guy but he played the part so well. Zamperini’s treatment was tough viewing. The only problem is that the second half of this 137 minute length is literally just watching him being beaten endlessly with kendo sticks and by his own comrades. I say, own comrades. They were all ordered to punch Zamperini in the face or let their injured face more torture. Harrowing stuff. I hate to say this but once you’ve seen Louis being beaten about for five minutes, you realise there isn’t much else. There were a couple of actors that popped up. Jai Courtney (Divergent), Luke Treadaway (Clash of the Titans) and Garrett Hedlund (Tron: Legacy) did as well as they could but their characters were so far in the background that it was hard to pull them out of it to make more memorable impressions. The emphasis was always going to be on Zamperini. I understand that this is his experience but the length didn’t justify the means. The punching scene was mental. If it is true and not exaggerated for the film, how did that man survive? The radio broadcast sequence was interesting as Zamperini is bribed by his captors. Good food and clean living for his denouncement of America and their involvement in the war. BUT of course, this man will not be broken. There were moments where I was rooting for him, especially in his “crucifixion”. Forced to lift a railway sleeper above his head. If dropped, he would be shot. However, I felt that it was all a little too similar to The Railway Man that was released last year. It may be unfair to compare (Did that rhyme? Totally rhymed) but Unbroken did fall slightly short. Jolie wasn’t afraid to show both sides at their worst. As the prisoners are transferred from one camp to another, they are forced to walk through a town that had been destroyed by the American B-bombers. There were some revelations in the closing minutes. But it would have been nicer to see them in the film than just read about it. The fact we didn’t know what had happened to Zamperini’s comrades after they were sent to different POW camps until the end credits was a little disappointing. But it was still a fitting and uplifting footnote to a dreadfully visceral and tough journey. Certainly worth a gander and O’Connell’s performance cannot be broken. BUT the pace and the story line could have been a little bit more.